Gives meaning to the word soul and brother. And he sings about it. Where ever he goes, no matter if there is stormy weather, there is always a rainbow above him. Check out his web page with the ultimate in surf design that utilises Hydroflex Technology. 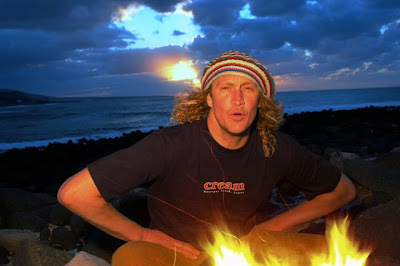 Robbie Page singing away by the fire in Lanzarote when when we meet in the path in 2004. Contact photographer David Seri for more projects like this.